On the side away from the axis, usually refers to the underside of a leaf relative to the stem. 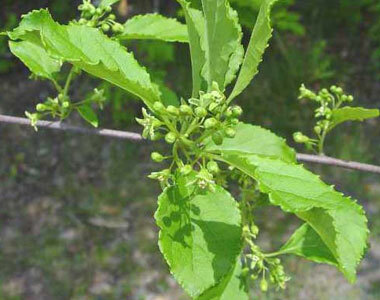 Shedding branches, leaves, or flowers at a seam; usually seasonally (i.e., leaves abscise in the Fall in New England). With lower leaves reduced to sheaths or scales so that leaves/flowers appear to arise directly from rootstock. 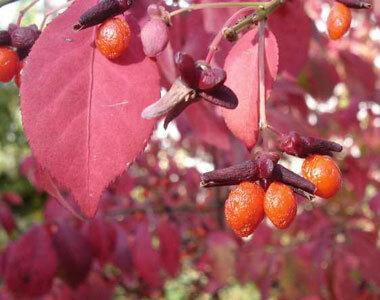 A dry, usually 1-seeded fruit that does not separate or split open at maturity. Lacking chlorophyll and therefore incapable of photosynthesis. In the direction of the tip or apex. Radially symmetrical; a shape that can be divided by 2 or more planes into roughly equal halves, usually refers to the perianth of a flower. Tapering to a narrow point, more tapering than acute, less than attenuate. Condition of an apex with more or less straight sides that meet to form an angle of less than 90°, more pointed than obtuse, but less pointed than acuminate. On the side toward the axis, usually refers to the top side of a leaf relative to the stem. An organ that is fused with a structure different from itself, as when stamens are attached to petals. Lying close and flat, usually referring to leaves growing up against the stem. A structure such as a bud or root that is produced on an unusual part of the plant (i.e., roots that come from stems). A species not intentionally introduced; growing here and there. Plant tissue that is filled with large air spaces, usually in the stem or rhizome/root. On aquatic plants, the leaves that are produced above the water's surface. A fruit such as a raspberry that is actually composed of multiple, fused fruits (small drupes). 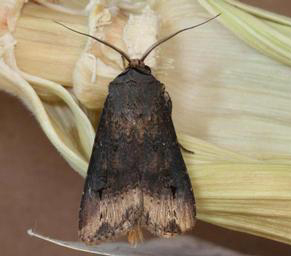 Black Cutworm, photo ©Adam Sisson, Iowa State University, Bugwood.org. 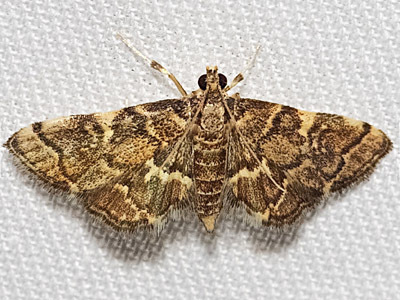 Unspotted Looper Moth, photo ©Carol Wolf, North American Moth Photographers Group. Species that do not occur in the same geographic ranges. A node bears only 1 similar organ, such as a leaf or flower (compare with opposite, whorled). 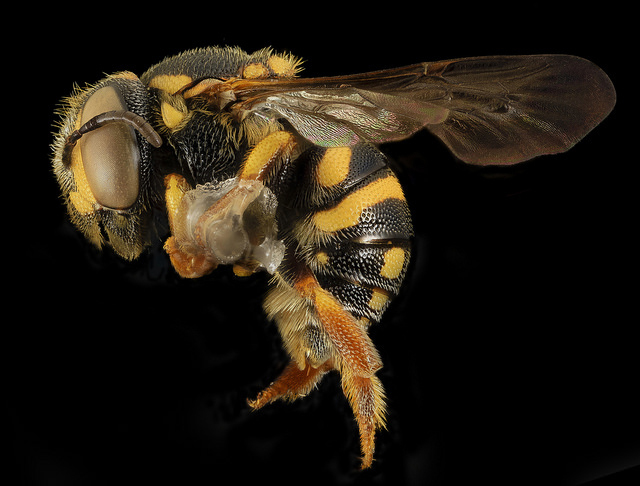 With many angular cavities, like a honeycomb. Catkin: a slender, usually pendulous inflorescence, with crowded male or female flowers. Plants adapted to living in water or on land. With stomata on both leaf surfaces. 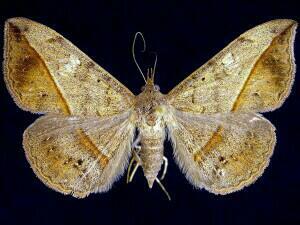 Yellow-spotted Webworm Moth, photo ©Carol Wolf, North American Moth Photographers Group. 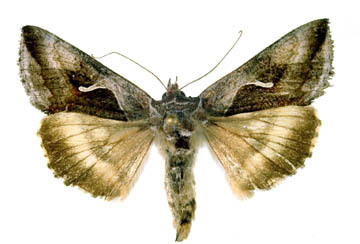 Celery Looper, photo ©Robert J. Bauernfeind, Kansas State University, Bugwood.org. 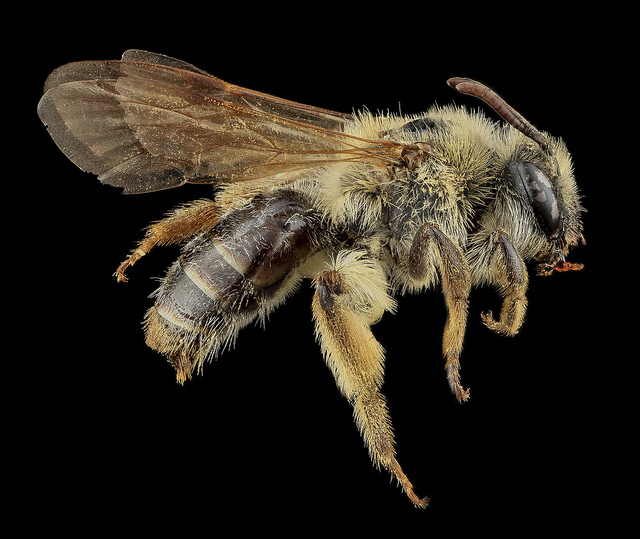 Long-lipped Mining Bee, photo USGS Native Bee Inventory and Monitoring Laboratory. 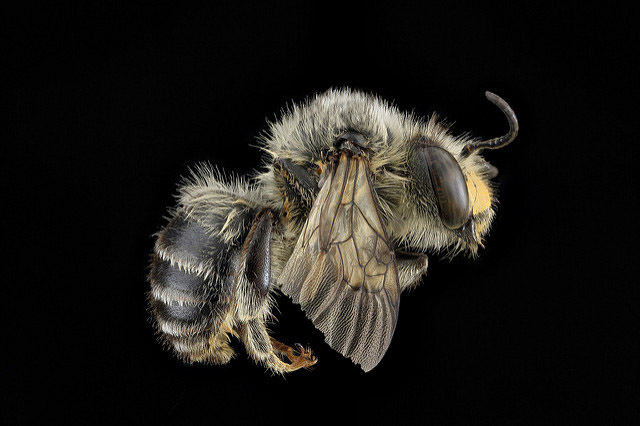 Mining Bee, photo USGS Native Bee Inventory and Monitoring Laboratory. 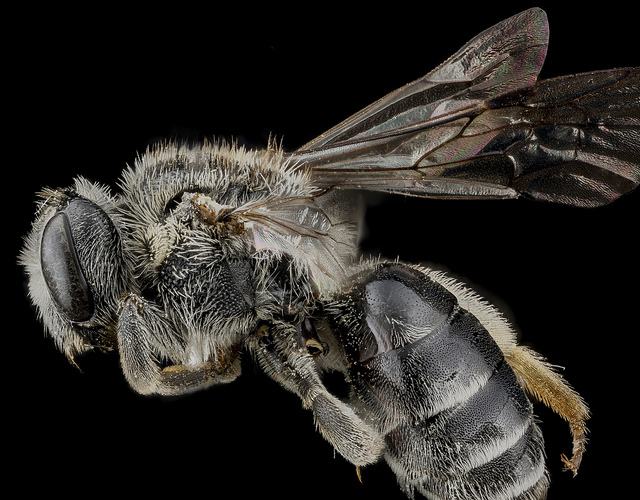 Nason's Mining Bee, photo USGS Native Bee Inventory and Monitoring Laboratory. 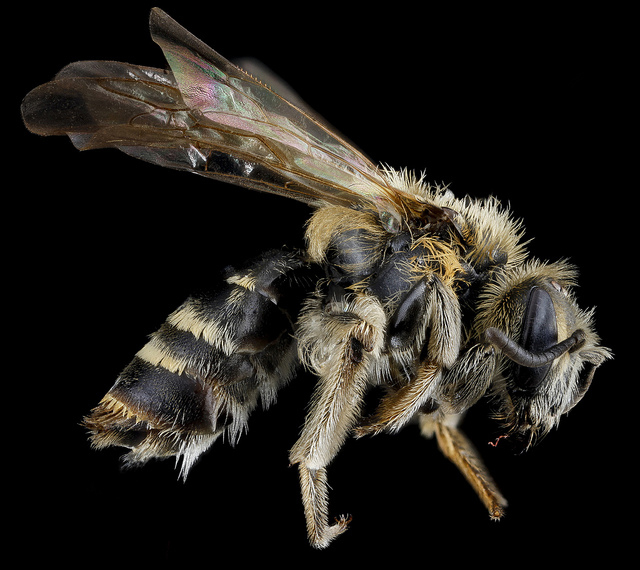 Golden-Alexanders Andrena, photo ©Brooke Alexander, USGS Native Bee Inventory and Monitoring Laboratory. The collective term for the male organs (stamens) of the flower. With both male and female flowers in the same inflorescence. 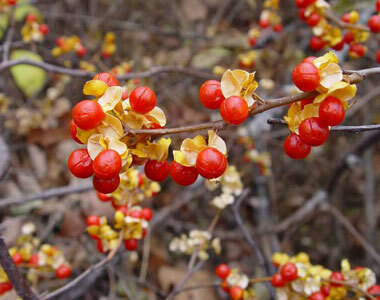 Flowering plants that bear seeds that are enclosed in an ovary. With edges where two planes meet (come together at an angle). Opposite: "rounded.". With two opposite leaves of very different sizes at the same node. A plant that lives for only one year. In Lycophytes, areas of the stem with smaller leaves that are produced at the colder beginning and end of the growing season. Like a ring, or with organs arranged in a ring. Ring of specialized cells encircling a fern sporangium. When the stamens are positioned opposite the petals in a flower. When the stamens are positioned opposite the sepals in a flower. The pollen-bearing structure in a flower, usually borne at the end of a stalk called a filament. 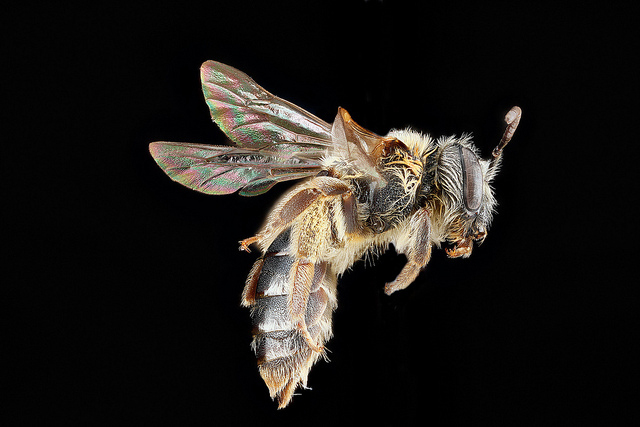 Leaf-cutting Bee, photo ©Joyce Amihere, USGS Native Bee Inventory and Monitoring Laboratory. Tinged or colored with a pink, red, or purple pigment. A purplish-red, usually protective pigment. 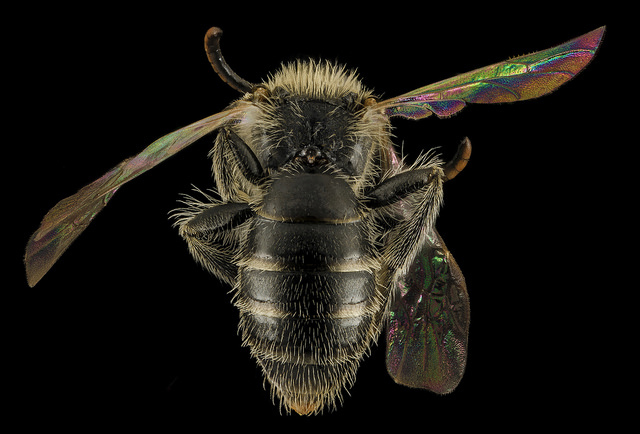 Chimney Bee, photo USGS Native Bee Inventory and Monitoring Laboratory. 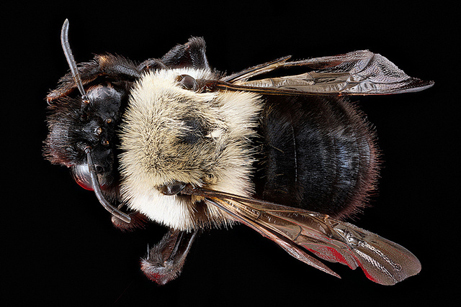 Orange-tail Bee, photo USGS Native Bee Inventory and Monitoring Laboratory. Caused, introduced by, or resulting from human activity; a disturbed or man-made habitat. 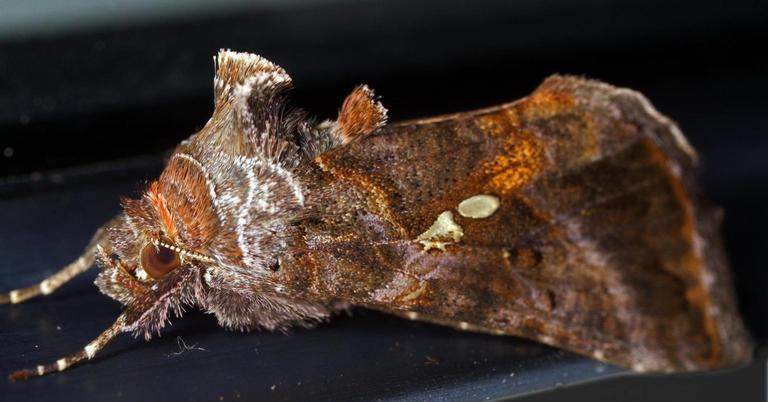 Velvetbean Caterpillar Moth, photo ©Jim Vargo, North American Moth Photographers Group. Pointing upward or forward toward the distal end. With basal leaves much reduced or absent. With an abrupt, short, projected tip. 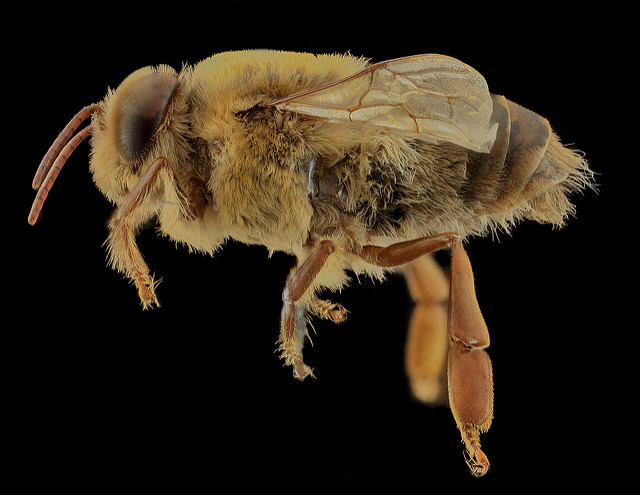 European Honey Bee, photo USGS Native Bee Inventory and Monitoring Laboratory. Clasping, as with a leaf with two bases that wrap around the stem. The production of seeds without fertilization. The outer part of a cone scale that is exposed even when the cone is closed. Uncommon but not rare; some cause for concern due to declines or other factors. A secondary projection, ear, or other piece of tissue attached to a main structure. Arching, as in curving veins in a leaf blade. A bounded space, as with leaves with net-like venation. An appendage of a seed, usually brightly colored, fleshy, and/or sweet, that attracts animals to eat it and coincidentally disperse the seed. Tipped with a long, slender bristle. Protective sharp projections like bristles, barbs, or thorns. Bearing a sharp projection such as a prickle, spine, or thorn. One structure joined to another, usually at a point where the two will separate. Diverging from an axis at an angle of 15–45°, less upward than erect, less outward than spreading. Without male or female organs; reproducing vegetatively, without fertilization by another plant. With unequally sized or shaped parts on either side of a central axis. Tapering very gradually to a prolonged tip or base. 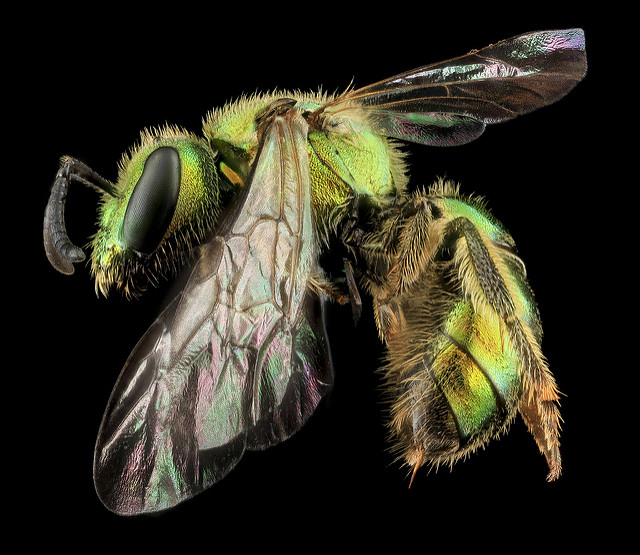 Golden Green Sweat Bee, photo ©Phillip Moore, USGS Native Bee Inventory and Monitoring Laboratory. 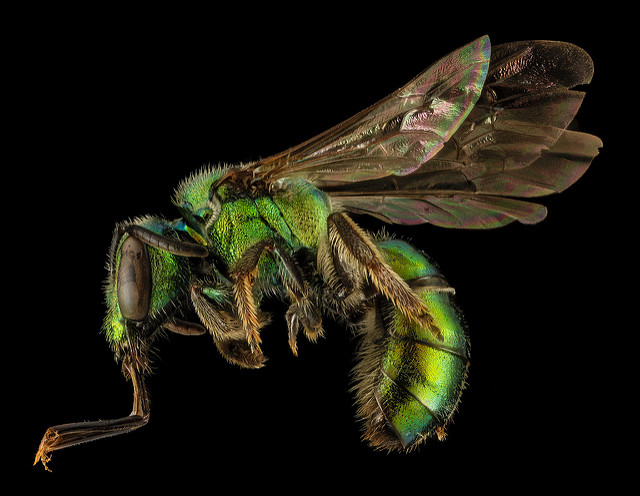 Blue-green Sweat Bee, photo USGS Native Bee Inventory and Monitoring Laboratory. 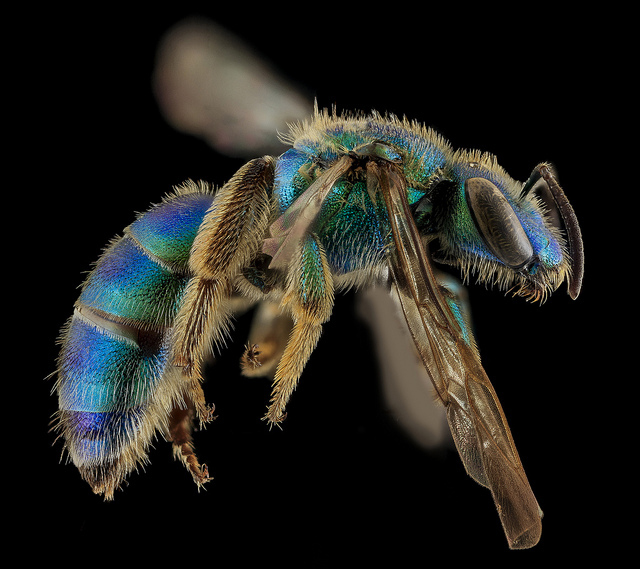 Blue Sweat Bee, photo USGS Native Bee Inventory and Monitoring Laboratory. Ear-like lobe (usually refers to a leaf base). The botanist who first officially named a taxon. 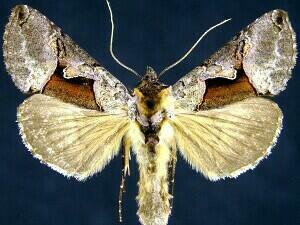 Large Looper Moth, photo ©Jim Vargo, North American Moth Photographers Group. 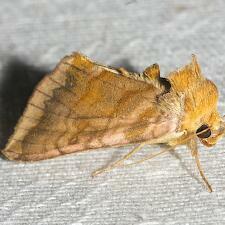 Common Looper Moth, photo ©David Cappaert, Bugwood.org. A plant that makes its own food from raw materials obtained from the sun, water, and soil. Depressions or cavities in a surface. Fine bristle (usually referring to scales of Carex or bracts of grass flowers). The juncture where a lateral organ, such as a leaf, joins a main axis, like a stem. A flower that emerges from an axil (i.e. the juncture between a branch or leaf and the stem). The main stem of a structure, such as a plant or inflorescence.